Kanahus Manuel hasn't added a story. Kanahus has been at the forefront and frontlines of the Indigenous Women-led resistance movements for over a decade. Kanahus, is not just a life-long Land and Freedom Fighter, she is also a traditional Midwife, a traditional Secwepemc tattoo artist and a mother of four Freedom Babies. (Freedom Babies: https://vimeo.com/92689158). 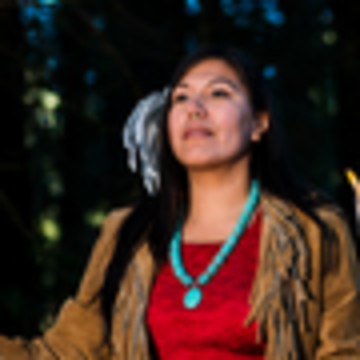 Most recently, some of her most important work has been to stop the reopening of Imperial Metals Mount Polley mine, whose criminal negligence caused “Canada’s worst mining disaster,” that devastated and poisoned her traditional homelands, pristine watershed and her Peoples traditional salmon spawning grounds. ** It is URGENT, at this time, to stop some of the illegal processes happening right now in regards to the province and proposed mining operations: Imperial Metals has been issued a full operations permit and long term discharge permit which Kanahus has been active in opposing, as well as, the Imperial Metals Ruddock Creek Project which is in exploratory stage in her Tribes glaciers and Sacred Headwaters. Kanahus' is working in collobaration with other Indigenous Tribes and Indigenous Resistance Movements in BC also opposing Imperial Metals mining projects and they are calling on a Resistance Gathering marking 2 years since the Mount Polley disaster. By donating to Kanahus' Land Defence Fund, you are helping with the on-going work, travel expenses, media, video production, public outreach, mobilization, political education and direct action. Please consider contributing $5, $10, $20, $50, what ever you can. PLEASE DONATE WHAT YOU CAN AND SHARE THIS WITH YOUR CONTACTS! Kanahus Manuel hasn't posted any updates yet. Kanahus Manuel is managing the funds for this campaign. The campaign is for a personal cause.